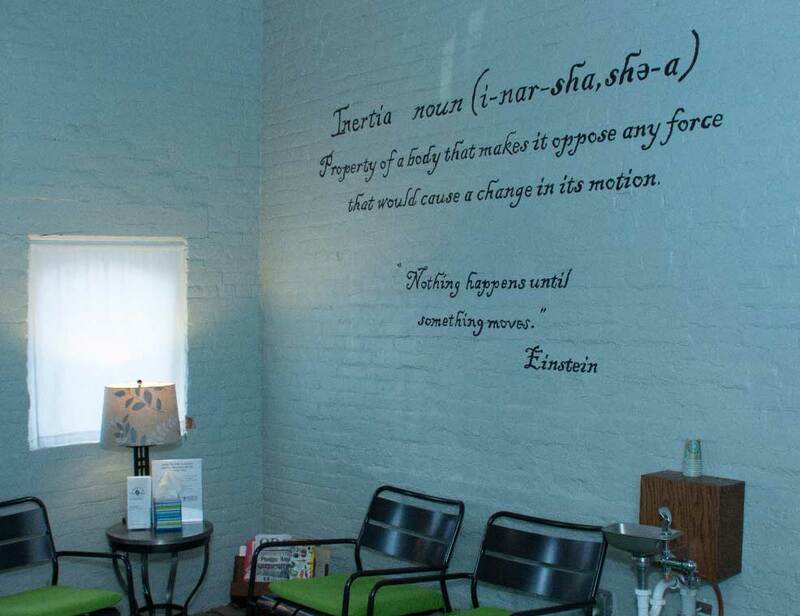 The waiting room at The Inertia Wellness Center. Inertia Wellness Center is dedicated to providing individuals with the highest quality of comprehensive rehabilitation services. We strive to assist those we work with to achieve his or her maximum level of function. Comprehensive services are an integral part of the total rehabilitation continuum. The quality of life reached is directly proportional to the quality of effort given by out staff. We at Inertia realize that everyone has unique needs, concerns, and resources. We strive to acknowledge, understand, and respond to those unique needs. Community integration allows life to be lived to the fullest capacity. To achieve such high quality care, we believe the treatment team needs to work and communicate in concert. This team is directed by those we serve. Staff at Inertia Wellness Center strive to maintain optimal standards of professional practice, as well as exercise professional judgement in the delivery of services. We all adhere to, and support the mission, purpose, philosophy of Inertia Wellness, and follow the code of ethics of each individual profession providing service.